Eric added some pavers and plants to the grill area in the backyard. It really came out nice. 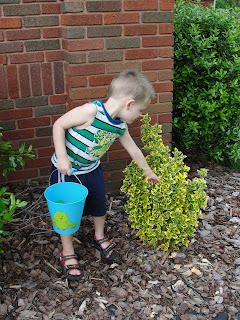 This is the first step to improving the look of our backyard. We have been trying to figure out what color eyes Michael Owen is going to have. Sometimes they look green and other times brownish. I even see gray every once in awhile. I took some close up pictures of his eyes. What color do you see? Evan woke up early Saturday morning crying and saying that his ear hurt. I took him to the doctor and both ears are infected but one was worse than the other. He gave us prescription and we went home. He had no fever or any other major symptoms. Just 2 weeks ago he had the same thing. You would never know this kid had an ear infection or even felt bad based on his activity yesterday. Eric took a little video of our "sick" kid. Today we was fine and had a great day until dinner time. He looked horrible and he was complaining about feeling yucky. He was exhausted. He got a quick bath and went to bed at 6:30! That's early for him. He just doesn't stop! I took a picture of Evan with the famous bear when he was about 5 months old. I put Michael Owen in the same outfit and recreated the bear picture. So cute! 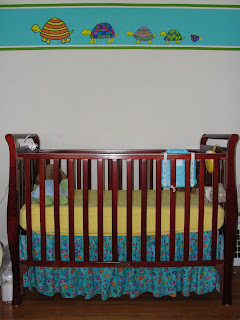 I forgot to put pictures up of the nursery! I used the same theme and curtains as I had when Evan was born. 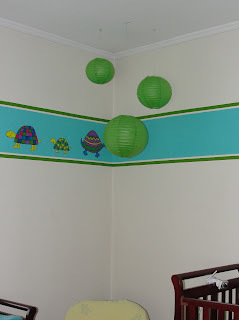 Turtles! I decorated the room a little differently this time. I painted a turquoise stripe around the room. 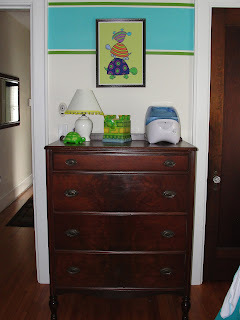 I added a green stripe above and below the turquoise stripe after we found out we had a boy. 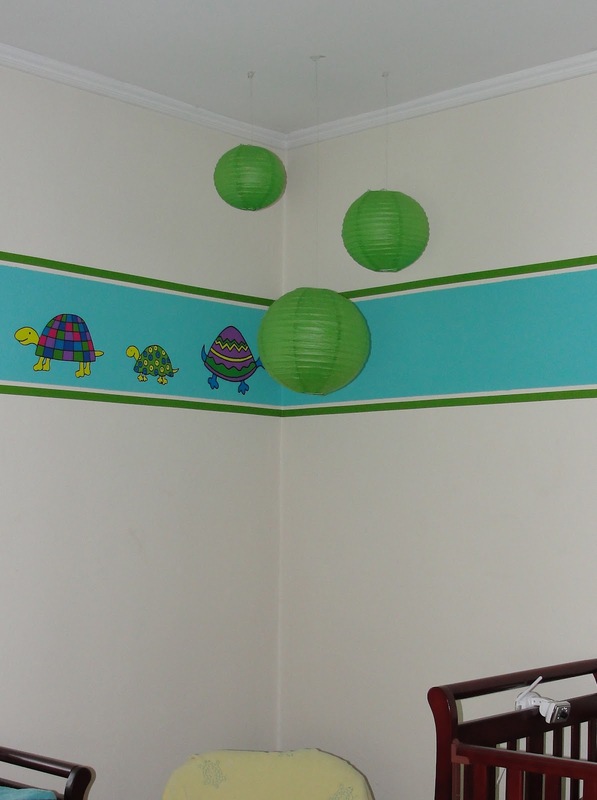 I also put turtles inside the turquoise stripe all around the room. Everything turned out great with he help of my mom. I love being in his room! I filled a little container up with water and gave Evan some foam brushes and told him he could "paint" the deck. He actually enjoyed. However, it didn't last long and he was on too something else. 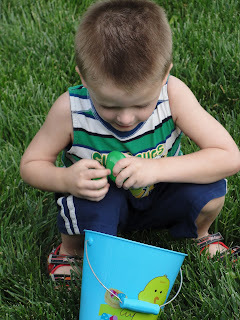 This was his first time dying eggs this year and he really enjoyed it. Easter was pretty simple this year. Evan and Eric went to a baseball game which Evan was looking forward to. 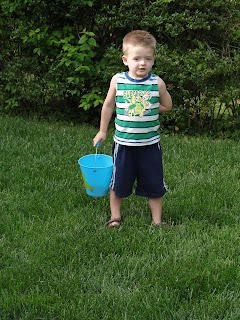 Afterwards, we had a little Easter egg hunt out front. It was a really good day.